I was reading a thread on Splitcoaststampers this morning about your Top 5 Stamping Investments. The idea was to choose your Top 5 best "investments" you've made in your stamping -- tools, stamps, etc., that were maybe pricier than usual but you justified it by saying it was an investment. These would be the things that actually were worth the investment, and not just painful to the pocketbook for nothing! 1. My Craft & Rubber Scissors - these came in my Starter Kit and make mounting my zillion stamps "like buttah". 2. My Carl Cutter - chops 12 sheets of cardstock at a time! This makes prepping for my classes and workshops a breeze. If I had to buy one again though, I'd opt for the 15" and not the 18"... it's just overkill! 3. Many Marvelous Markers - I use the markers in so many ways, I just can't live without them. I earned them through Stampin' Up! 's Great Rewards incentive plan, so I didn't have to pay a dime (woohoo). 4. Crafters Tool Kit - I'm a sucker for organization as you know, and I love all the doodads inside. The Mat Pack & Paper Piercer get used on at least 1/2 my cards, and the tweezers save my fingers when I'm embossing small projects. 5. Watercolour Wonder Crayons - I ordered the entire set 2 years ago when they came out, and then picked up the neutrals this year. Throw in an AquaPainter and you're in business! Suffice it to say that anything that helps a shy SAHM who suffers from anxiety disorder and panic attacks completely came out of her shell, make PHENOMENAL friendships, enjoy a dream job and get to contribute significantly to the family income...well, it's got to totally rock, right? Who would have thought???! Anyhow, enough about me, right!? LET'S HAVE ANOTHER CONTEST GIVE-AWAY!!! Share with me via the Comments feature what YOUR TOP 5 stamping investments have been (they don't have to be SU products) and get a chance to win a new & unmounted "Blooming with Happiness" Level 1 Hostess set! Contest ends January 31, 2007. GOOD LUCK! Oh boy :-) Another wonderful contest!! 1. By far the best purchase - SU markers. I use them every day for all sorts of stuff. LOVE MY MARKERS. 2. Cardstock. I know this sounds weird - but I really like cardstock and the more the better!! 3. RIBBON - again - this is pretty generic - but I love ribbon. 4. SU - embossing thingy that catches all the powder. I suddenly can't remember the name. But I use it all the time. Oh this is one of my FAVOURITE sets. I've tried to buy it on ebay...but I never get it! My top 5. 1. I LOVE all my SU stamp sets and inks but my SU aquapainters are fantastic - not necessarily an expensive purchase but I love using them! 2. My pink Quikutz tool and the "pick-up" tool. I love the versatility and the fact that I was able to get away from stickers. 3. Like you Caro, my Creative Memories starting kit was SO worth the money. I didn't last as a consultant but the tools I got with my kit - priceless. 4. This sounds dumb, but my SU stamp cleaner. I used baby wipes for so long and I was so tired of getting that ink and stuff all over my fingers! 5. My Sticker Stadium. I ordered it online but it's been invaluable for holding all my punches and cutters. I can see everything and it's nice and neat! Thanks for this idea. It made me really think about the things that I have at home. Sorry if this is a double post. Lose my internet connection as I was about to publish my comments. 5. SU gold/silver/copper cord .... love this stuff!!!! It is hard to pick just five but these are the five I definitely use the most. 5. My card stock (have to force myself to use it. I just want to horde it...but for what? I have to say the number one handiest item I've ever bought is my ATG 700 tape dispenser from Scotch. You just push and go and the two sided tape rolls onto your cardstock. Definitely a "must have". # 2 would be my cutter. I have and 18inch and a 30 inch from Dahle but I seldom use the 30 inch. # 3 My Scor It tool. It makes scoring paper a breeze and makes a nice crisp fold. # 4 My markers. Love to watercolor with them. # 5 My light box. I do a lot of embossing and this tool is a must have. 1-my very first stamp, a pine tree from Hero Arts. 3-my Carl Cutter altho I have a very old first generation one so its showing its wear now. 4-Crop-i-dile-when the hammer head flew off one night from my MM set, and almost hit the sliding door window, knew it was time to move on. 5-finding the right glue/adhesive one for me and I have settled on the Trio. I just bought enough at wholesale to get me thru the next 5 years. I use all three sizes equally. I have other favorites here and thee depending on what I do but if it werent for the first two items, there would be no last three and I would probably be in the Caribbean permanantly by now! ohhh a contest - gotta love that! 1. my Craft & Rubber scissors - with so much rubber cutting can't imagine not having them! 2. my mat pack and piecer - love that look! 5. carl cutter - has saved me so much time prepping for workshops and classes - invaluable! Thanks Caro - great idea! 1) Various trips to the States (for work actually) where I have haunted all the Target dollar spots, Dollar Trees, etc. that I could find! (I dare not go in a regular scrapbooking store or I would bet the farm!) I love a bargain and I have picked up some great stamps, embellishments and DP from these stores! 2) Every color of ink and CS that Stampin' Up carries rather than just the ones I am most comfortable with (Earth Elements). It forced me out of my box! 3) Punches! Got my gigas just the week to add to the brothers Mega and sisters Super Jumbo (not to mention all those SU and minis I have). 4) Dollar stamps. Now, while this is not really an investment, I have bought everyone I have ever found. Since I have a huge bin of them now...they have turned into an investment. But they are fun and my son loves to stamp too now! 5) DP...cannot leave a store without some (and I have lots!). 4) SU Water Colour crayons (just started using them, but they are so pretty and eaxy to use with the aqua painters- I feel like Monet or Van gogh! 5. Prismacolors / salvador ( gamsol ) and stumps. I am also very partial to ribbon and brads. LOL. The one thing I really want to add to this list would be the su water colour crayons! 2/ Versamark - I use it on every card I make! 5. My professional quality pencil crayons that I have finally figured out how to use! My cuttlebug-I use it all the time on my cards, LOVE IT!!! My new sewing machine! I love to sew on cards, I just got this for Christmas from my mom! 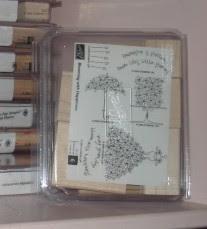 My zig markers (Can't wait to get the Stampin' up ones) I use my zig markers alot right now. I'm sure I'm missing stuff, but these are what popped into my mind right now. By the way, great blog! I just came across it while searching the splitcoast bloggers website! Number two would have to be the SU stamp cleaner. That made such a difference to getting my stamps clean easier. Number three would be the SU Marker set that I recently got as I can use it for so many things. My cutters would be number four - I have two. One is Carl and the other is a Fiskars for smaller measurements. And number five would have to be my Versamark stamp pad and pen. I love using them with and without embossing! Whew, that took work! Thanks again Caroline! 1) Stampamajig - I use it on EVERY card! 4) SU cardstock - it's the best! 5) Color Caddy - perfect for storing my inkpads! I would have to say that my stamps and my inks are my best investments but besides that here are my top 5. 1. ATG = LOVE this baby! 2. Fiskars Rotary Trimmer - bought it at Cosco and cut up to 5 sheets of SU! cs at a time! 3. SU! Markers - love these so much don't want to share them! 4. Cropadile - perfect for eyelet setting when the family is sleeping! 5. Digital Camera - for sharing my cards on SCS and with other demo groups. 5. my SU markers - I am in the marker club so have yet to get the markers, but I love the 4 individual ones I have so I know I will love love the set. 1. Craft & Rubber Scissors - I was skeptical until I tried them. They are a must have in the first purchase! 2. Versamark stamp pad - Another item met with skeptism... until I tried it at Caroline's! 3. Heat Gun - I LOVE embossing. What an easy way to step up the quality of your work! 5. Cutter - Who can live without their all-purpose cutter (extra points for the optional scoring blade). There you have it! Thanks Caroline for a great contest!!!! Wow, to narrow it down turthfully to the top 5 isn't easy...lol..
3. The SU scissors make cutting rubber so much easier.....I thought it expensive just for scissors.....but you can't live with out them now. 5. Double sided tape......this is a definite must as glue is just sooo messy for me. Thanks again for keeping me up to date and I would love this set of stamps to add to my collection. 1)My very large self-healing mat. 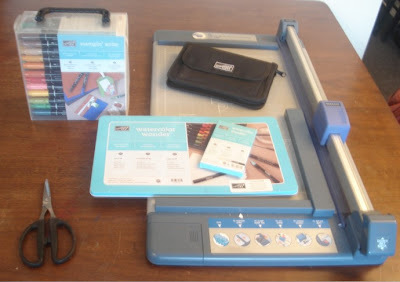 Purchased years ago for rotary cutting sewing projects, this covers about half of my kitchen table and provides a great stamping surface. 2) My SU markers. No comment necessary. 3) Stickles. I'm not as addicted to these as my sister, but they are so very nice and sparkly. 4) Mirror Card. Not inexpensive but so wonderful to add some shine to a card. 5) SU's Girlfriends and Accessories. By far, the most used stamp set(s) in my collection. Thanks for the fun Caroline!